This thick bleach is just the job for removing stains and preventing limescale. It has also been designed to kill germs, including Salmonella, E. Coli and Listeria. The pleasant citrus fragrance will effectively combat odours and as part of the essential Waitrose range it offers great value as well as quality. 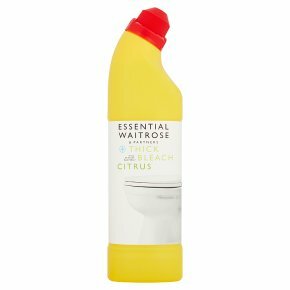 Essential Waitrose thick bleach citrus clings to surfaces to remove stains, prevent limescale and kills germs, including Salmonella, E.coli and Listeria. It's pleasant fragrance works to combat odours and keep surfaces fresh and clean. Safe for use by households with septic tanks.